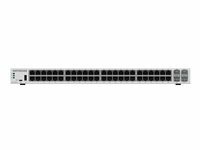 The Insight Managed Smart Cloud Gigabit Ethernet/10G SFP+ fibre switches are the first switches from NETGEAR with anywhere configuration and management. 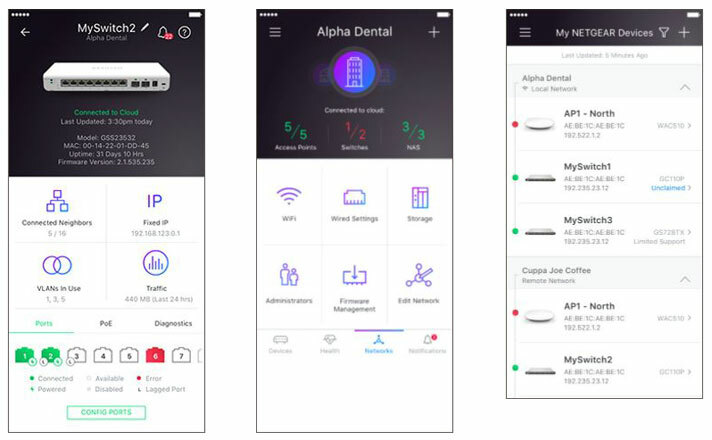 Using either the NETGEAR Insight app on your mobile device or tablet, or the Insight Cloud Portal* from your PC, Mac, or tablet, you can quickly discover, setup, monitor and manage your Insight Managed Switches, Wireless Access Points, and Business-class ReadyNAS storage devices, from anywhere! With their remote cloud manageability, sleek design, and both 1G SFP and 10G SFP+ fibre ports as well as 1G copper, Insight Managed Smart Cloud Switches are the most versatile switches in the market for any environment. Whether at home, out of the office or on a business trip, you can still manage and monitor your network as if you were right there, all from the palm of your hand and from anywhere in the world! As a leading provider of network equipment for SMBs, NETGEAR® understands the importance of reliable and high performance networks. With the growth of virtualisation, cloud-based services and applications like VoIP, video streaming and IP surveillance, SMB networks need to extend beyond simple reliability to simpler management and remote monitoring to ensure your network is “always up”. NETGEAR also understands that small business owners shouldn’t have to understand networking and IT; they need a network that’s easy-to-setup and is reliable, so they can focus on their business, not their network. To that end, NETGEAR is introducing our most versatile and easy-to-manage switches ever, NETGEAR Insight Managed Smart Cloud switches. 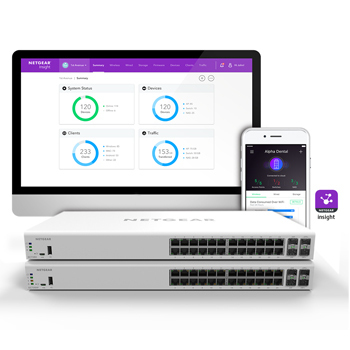 NETGEAR Insight Managed Switches and Wireless Access Points using the NETGEAR Insight app allow for cross-device automated configuration of VLANs, QoS, ACLs, LAGs, and PoE settings. 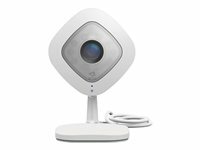 Auto-join and configure (zerotouch provisioning) allows for additional devices to be added seamlessly. Insight Managed switches are fully-integrated, cloud-manageable devices. Just connect and go. 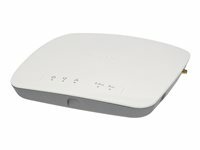 Insight Managed Smart Cloud switches have a modern, clean design, with a full complement of LEDs including power, cloud connection, PoE max, and fan status, as well as per port connection/link status and PoE power status. All models have whisper quiet fan(s), a Kensington lock receptacle, and are rack-mountable with the included rack-mount kit.